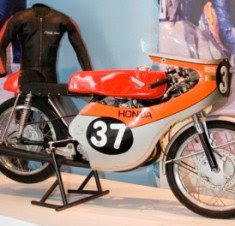 Nice story for motorcycle enthusiasts here as a new temporary exhibition opens at the Manx Museum on Saturday 30th May, celebrating the 50th anniversary of Honda’s arrival at the TT in 1959. Entitled ‘Honda The Golden Age’, it celebrates the phenomenal rise of Honda on the world motorcycle racing stage from their first entry into top flight competition through to their decision to leave the TT – having won all that there was to win in solo racing – after 1967. The exhibition includes the memories of Honda mechanics and riders including legends like Mike Hailwood, Tommy Robb, and Jim Redman. With some classic Honda motorcycles on display, together with archive film footage of Honda machines in action, this is one exhibition not to be missed by any fan of classic TT racing.